Posted on Tue, Oct 18, 2011 : 5:12 p.m.
Discount Tire relocated its original store from West Stadium Boulevard to 5240 Jackson Road in Scio Township. 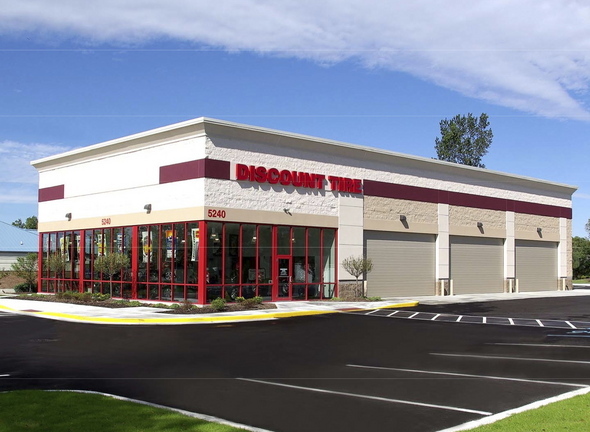 Discount Tire is celebrating its grand opening in Scio Township this week after the store relocated from West Stadium Boulevard to Jackson Road. The store opened its first location in Ann Arbor at 2270 W. Stadium Blvd. 51 years ago, according to a news release. It recently built a new 6,000-square-foot store at 5240 Jackson Road to relocate the original business. “We’ve built many improvements into our new location and look forward to serving our store guests more efficiently and effectively,” said Tim Ehinger, vice president of the Michigan region, in the release. The company won approval to build the store in May 2011, seven years after Discount Tire originally launched its plan to build a store in Scio Township. The plan was originally presented to the Planning Commission in 2004, again in 2006, and yet again in 2010. The relocation allowed the facility to double in size and quadruple its previous parking lot. The same 15 employees from the West Stadium location will operate the new store, according to the release. There are 57 Discount Tire stores in Michigan, and more than 800 nationwide. There are five locations in Washtenaw County. Wed, Oct 19, 2011 : 11:35 a.m. It's a shame the founder moved the company from Ann Arbor to Arizona. Good to see he's still in business. I think I'll try Discount Tire being a former Belle Tire patron. Tue, Oct 18, 2011 : 11:15 p.m.
Joe If you are concerned about the distance you can go to Belle Tire 1 mile closer to town. Tue, Oct 18, 2011 : 11:13 p.m.
Joe, you can find a new place at 5210 Jackson Road. Wed, Oct 19, 2011 : 2:24 a.m.
Tue, Oct 18, 2011 : 10:51 p.m.
Don't know why they moved? I will have to find another place. Tue, Oct 18, 2011 : 11:32 p.m.
At their new location, they have 5 bays, one more than before; the Michigan Avenue Discount Tire, at least when I went there twice in 1999, has eight bays. I expect that all the other Washtenaw County locations also have more than four bays. The new location has restrooms for their customers, and that probably makes it more convenient for customers to bring their babies with them; I've seen others bring their toddlers and babies with them into the tiny original store. Joe_Citizen, they have all your service information at the new location. Go in, and they'll pull it all up, ready to serve you, not to ask you a lot of questions about your vehicle and who sold you which tires and when. Of course, if relevant, they will want to know your vehicle's mileage; they would want to know that wherever you have your tires rotated. Tue, Oct 18, 2011 : 11:07 p.m.
Forgot my keyboard 5 works sporadically. Tue, Oct 18, 2011 : 11:06 p.m.
Maybe they needed more than parking spaces! Tue, Oct 18, 2011 : 10:47 p.m. This story continues a recent trend of identifying realistic computer-generated renderings as &quot;photographs.&quot; The image that accompanies this story is not a photograph. Today's story about the delayed opening of the new children's hospital also incorrectly labels a rendering as a photograph, and there have been others. This wouldn't be a big deal if the images were obviously fake, but with renderings that are this life-like, it's important to identify that they are not actual photographs. Wed, Oct 19, 2011 : 12:22 a.m.
Wow that's pretty concerning. I hope annarbor news doesn't make this a habit. It turns out honesty in journalism should extend to fake photographs. Tue, Oct 18, 2011 : 10:21 p.m. The new place looks nice. I don't think the current Stadium Blvd location was there for 51 years though. Tue, Oct 18, 2011 : 11:56 p.m. The original was about a block down the street on Stadium. It was really kind of a hole in the wall. Tue, Oct 18, 2011 : 11:36 p.m. I don't know if they were just south of Burwood before, but I do remember the Perfect Fit windshield service that was next door before Uncle Ed's muffler shop took its place, in its own brand new building.